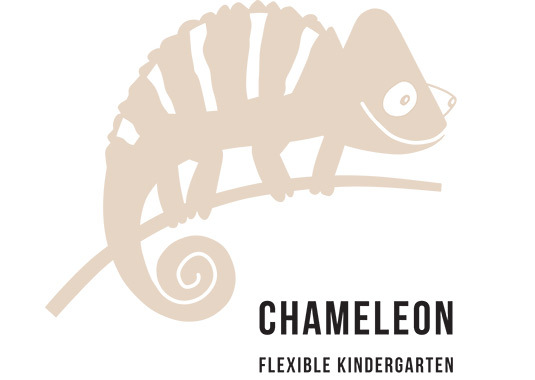 Kindergarten Chameleon is an interdisciplinary project, resulting from cooperation of several professionals, each of them being higly qualified and experienced in their field. Existing Slovenian planning and construction market is defined by criteria which favorise low costs, not being concerned with the product/project quality. On the other hand, there are companies and designers with considerable knowledge and skills which are succesfully following rapid development of technology or even setting new limits in their professions. 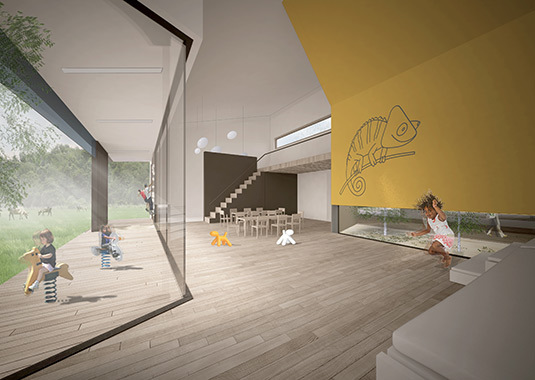 Project Chameleon evolved from the passion of such experts who are aware that architectural project is no longer just about design but a complex simphony of highest technological, environmental, economical, cultural and other aspects. 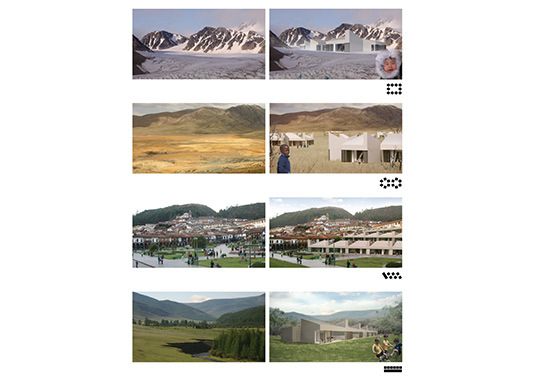 Architecture needs to respond to extreme complexity of context where each location, investor, users, etc. are unique. 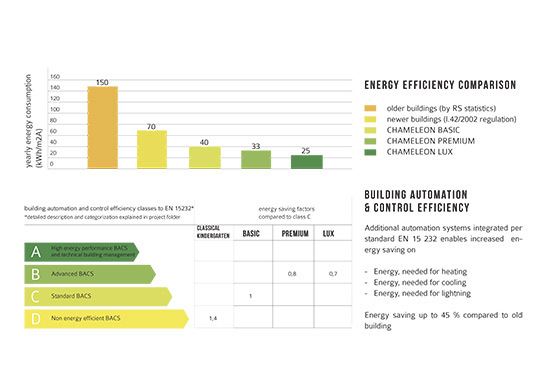 Chameleon wants to offer a solution how to make a simple system that would fit to any conditions and be able to adress the highest level of complexity. It should fit to any environmental, cultural, climatic, economical or other conditons. 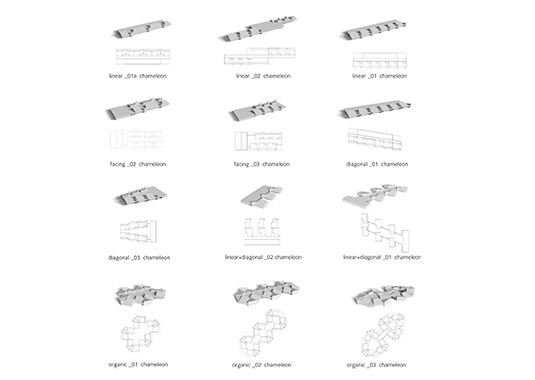 The architectural concept of Chameleon emerges from the idea of exchanging and interconnecting identical functional units of kindergarten into various urbanistic patterns adjusted to local individual demands. 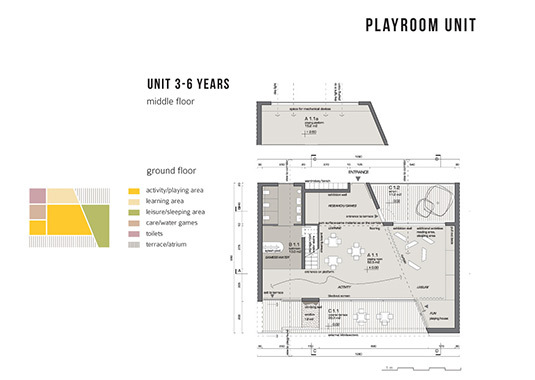 The playroom, which is the basic unit, is cut under a 22.5 degree angle, allowing it to join others in numerous combinations (angles combined to 45 degrees and/or 90 degrees). Such an intervention allows interior space hierarchy of bigger, smaller, higher and lower spaces providing ambiental and functional diversity. 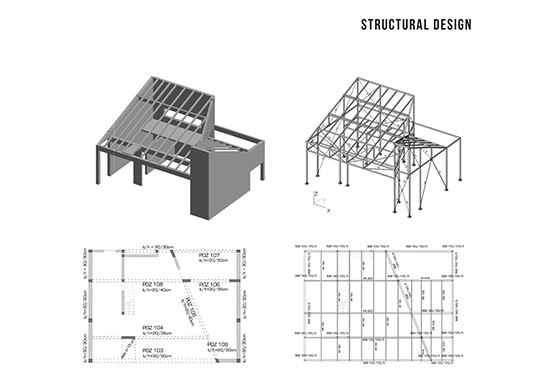 Playrooms are therefore self-efficient units, and include elements of experiences such as: water, trees, sand, light, height, sleep, action, … 22,5 degree cut of playroom volume appears in the roof structure as well, with angles changing from unit to unit. 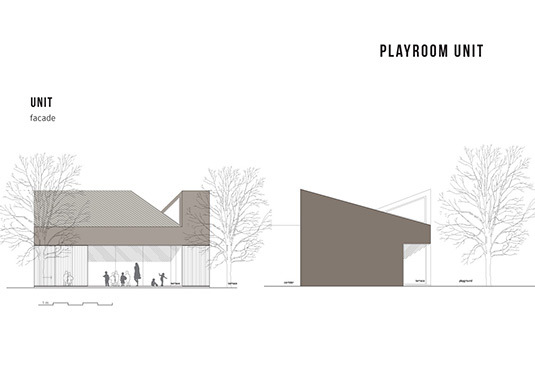 Repeating of such elements creates a complex dynamic structure, reflecting the program of active users - children. 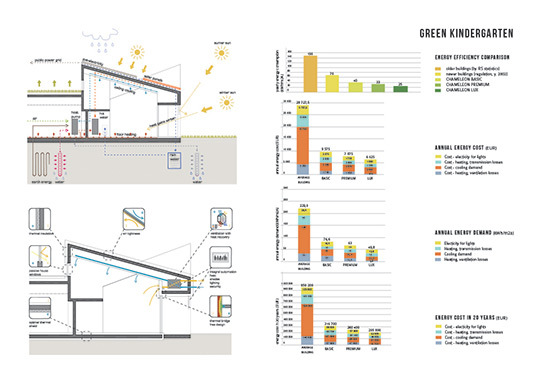 Functional and smart design of each unit (22,5 degree angle, roof structure, atrium …) makes it self-efficient and flexible for different types of users. 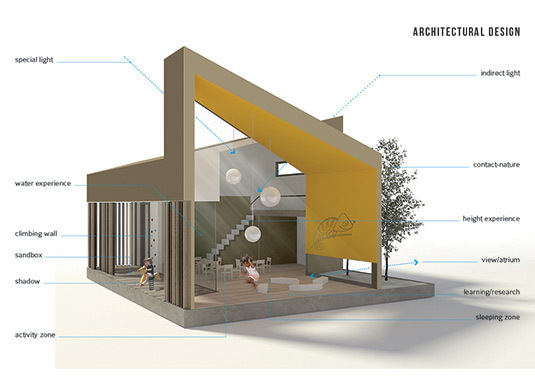 An advantage of modular unit is its complexity within simple layout. 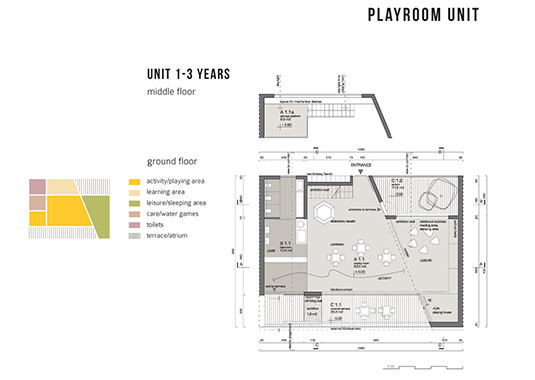 Modular units of playrooms enable flexible design and customised solutions. There are two types of units suitable for two age groups of children (1-3 years and 3-6 years). 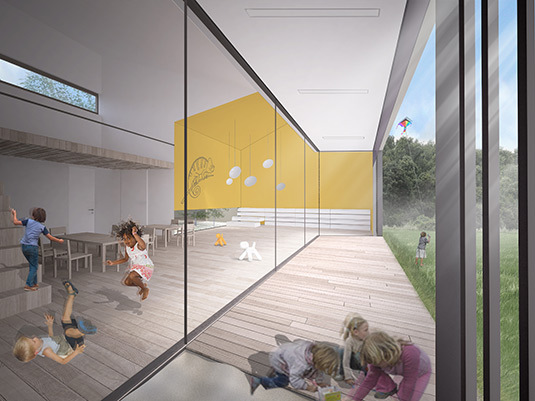 Modular units of playrooms enable flexible design and customised solutions from linear, diagonal, organic to other urbanistic patterns. 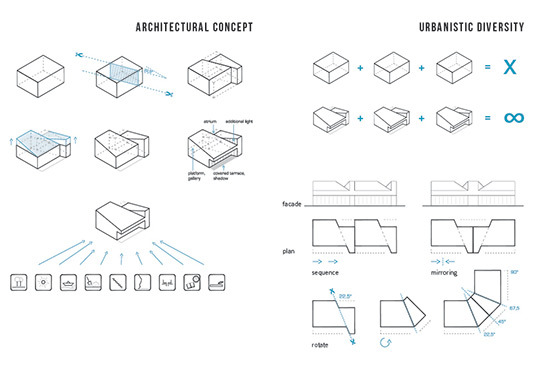 Such a system enables various urbanistic patterns depending on contextual parameters of location. 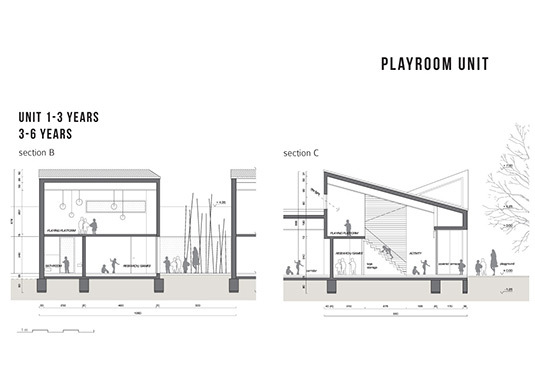 Urbanistic disposition and shape of the building complex emerges from 4 basic groups: linear, compact, diagonal and organic. 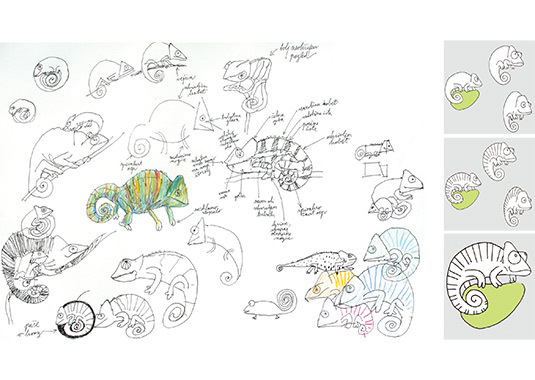 Various types of chameleons are found in different countries or different locations. They all consist of the same skeleton and same basic elements, being positioned in different urbanistic patterns with a range of skin color changes (façade and material). 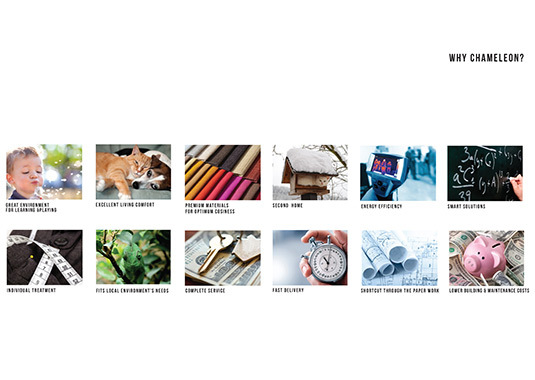 Chameleon offers complete service: from consulting, planning, building, financing to maintaining. 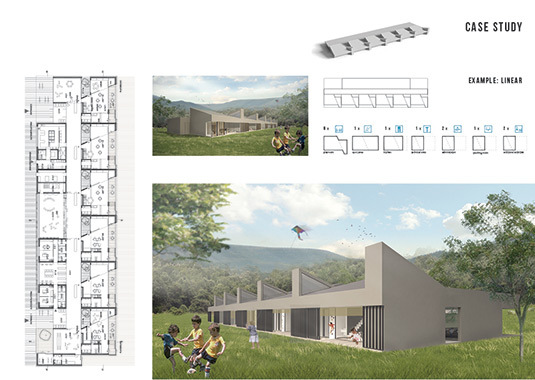 The client obtains a kindergarten tailor-made to his specific needs by selecting different levels of equipment and quality; these levels are enabled by the modular solution of the construction and installations. Flexible system, modular elements and high level of control keep the price affordable. 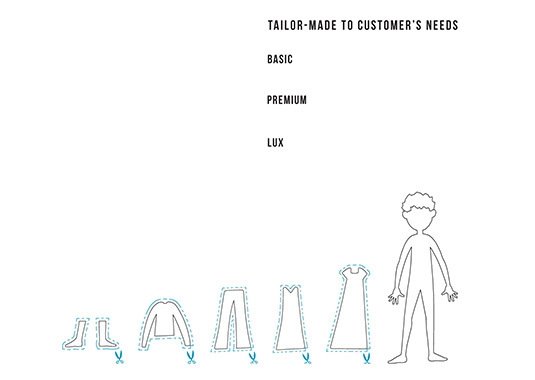 Three major levels - basic, premium, lux - can be combined and adjusted to customer’s specific needs.